Finlay was 13 years old when he first came to our office by recommendation of his pediatrician. 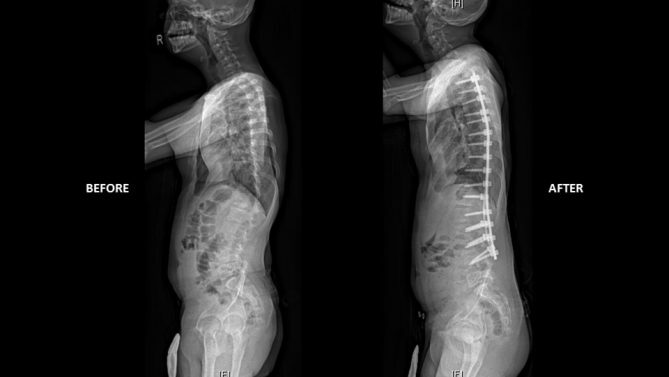 Finlay’s scoliosis presents in the setting of Down’s Syndrome and renal disease. Finlay’s curves measured 37, 53, and 55 degrees. We discussed the risks and benefits of surgery at length with Finlay and his family. To ensure safety during surgical planning, we worked closely with Finlay’s Nephrologist. 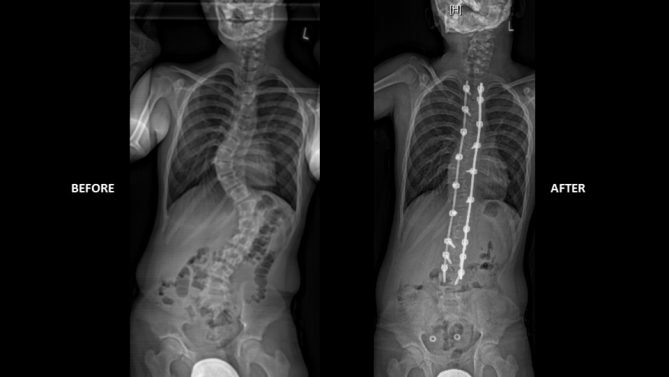 Finlay had a posterior spinal fusion from T2 to L4. Post operatively we did recommend physical therapy to help with hypotonicity of core muscles related to Down’s Syndrome. Finlay did well after surgery.